Don't need the full recommended package? Only at The Dog Outdoors do you get a 100% Satisfaction Guarantee & Warranty for your WalkyDog Plus. We also offer the best price, lightening fast shipping, and no sales tax (except in TX). 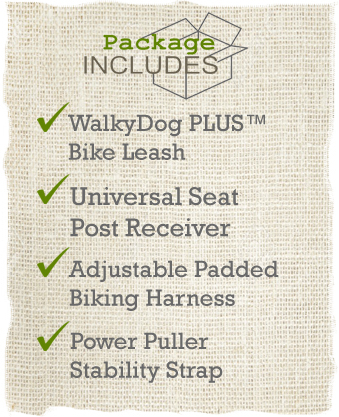 This EXCLUSIVE WalkyDog&TRADE; package is only available directly from The Dog Outdoors. Access to exclusive instructional video from The Dog Outdoors. Comes FREE with your package. High-carbon stainless steel construction with solid brass end-cap. Patented one of a kind quick-lock/release mechanism. 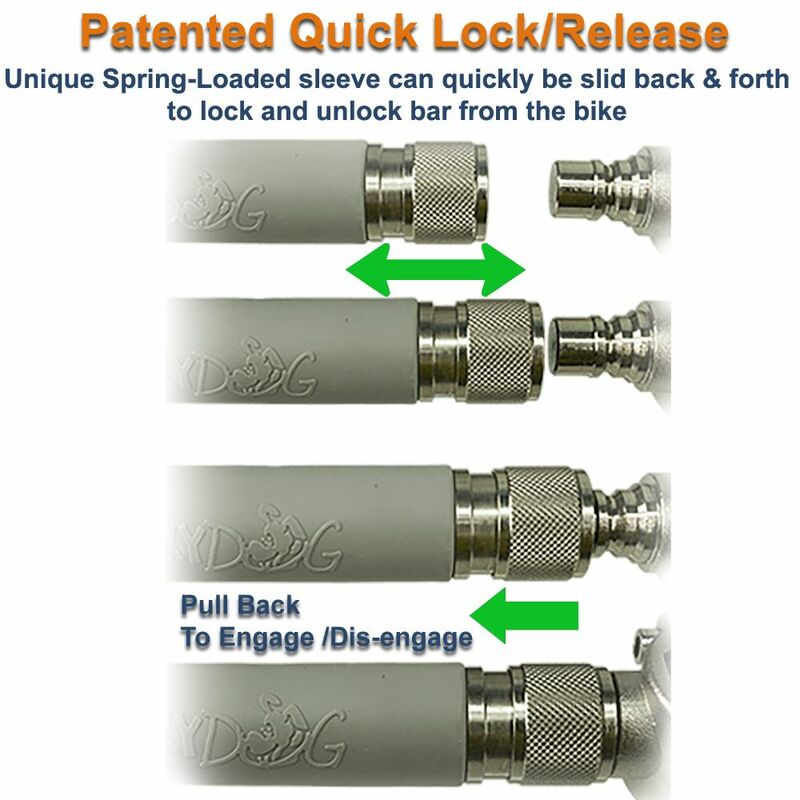 Allows for quickly attaching and detaching the bar portion in under 1 second for safe storage or use on another bike. Universal adjustable seatpost clamp for mounting on nearly any bike seatpost or frame. 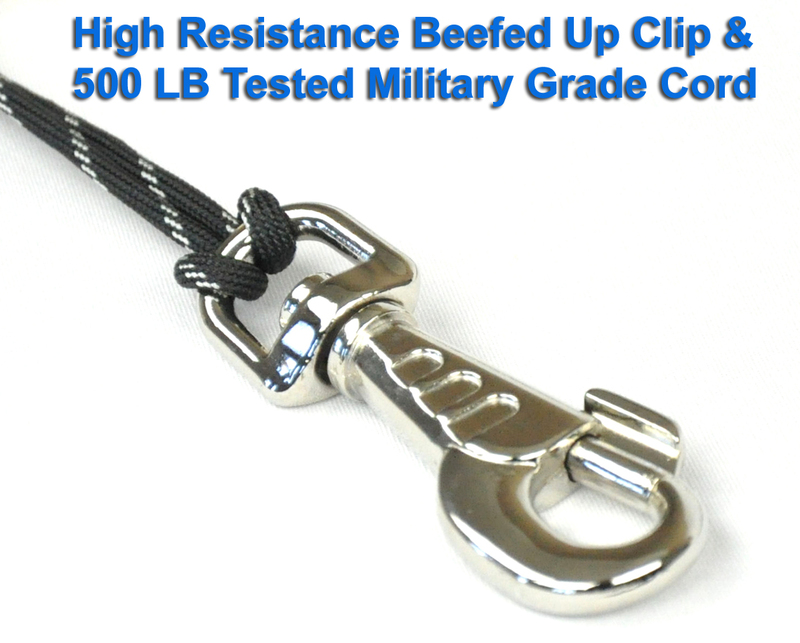 Fully adjustable cord length for dogs of different heights. It's simple to install (with only two bolts) and most dogs take to it right away with little to no training needed. It's a great way to let your dog release energy - especially for dogs that are home alone all day. After all, a well exercised dog is happier, less destructive, and better behaved. Internal springs in the Walky Dog bar provide stretch and pull absorption if your dog should jerk away, making it easier to keep your balance. Unlike a normal leash, the WalkyDog keeps your dog positioned safely to the side of your bike and away from the front tire. You can quickly remove the bar for safe storage or switch it to another bike (spare jaw clamp required) due to the patented quick release. 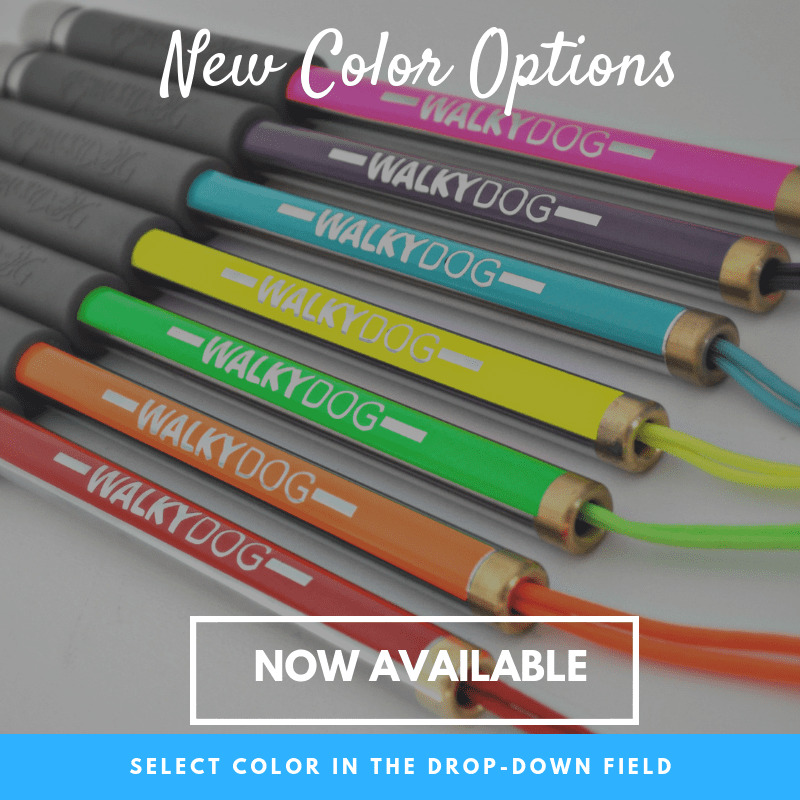 This is only available with the WalkyDog brand. It's easily adjustable to work with dogs of different heights and sizes. The cord can even be replaced making this a product that can be made like new again even after years of use. The WalkyDog is just plain FUN! Learn how to properly use a dog bike leash and decide if it is right for you and your dog/s - Tips & Safety. 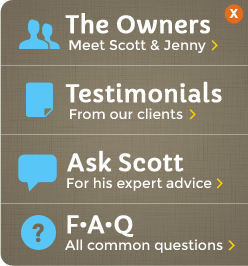 We are always here to answer any questions you may have. 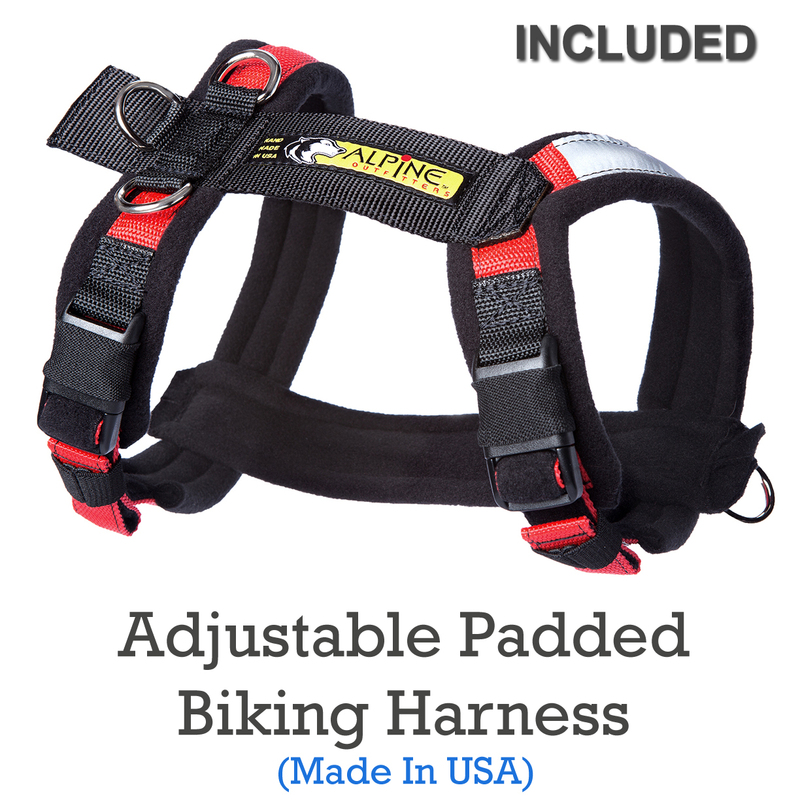 The WalkyDog Plus goes great with a dog harness with padding. We recommend this for the comfort of your dog. Learn more about the WalkyDog and a dog pulling harness. Will it work for my dog? Will it fit my bike? "A regular workout is ideal to keep your dog fit - suggests Dr. Salvatore Mistretta, veterinary doctor - and may also turn out to be a chance for both dog and owner to play and have fun together". Unfortunately, not everybody has the possibility to exploit wide open spaces where their dog can be free to roam; more often, one can only dispose of a small city park where regulations impose the use of a leash. Thanks to the WalkyDog bike leash, a new type of pet accessory produced by BICE SRL and specifically developed for biking dog-lovers, today it is easier to allow dogs to exercise. "To trot next to the bike - explains Dr Mistretta - allows dogs to complete an aerobic exercise which beneficially affects not only the weight control, but also the cardio-respiratory system; by riding in the open air, the animal also has the chance to see people and other dogs, which is good from a behavioral standpoint". The use of the WalkyDog is suggested for adult dogs, subject to a complete veterinary examination. Such an examination should verify that the animal doesn't suffer from any cardio-circulatory problem. Elder dogs should also be submitted to cardiologic exams to evaluate the efficiency of their heart. In the case of large breed puppies, it would be better to choose a different workout. Excessive efforts before turning one year old, can facilitate the appearance of pathologies of the osteo-articular system such as hip displaysia - especially among breeds genetically predisposed such as the German shepherd. It is also not suggested to force even healthy and fit dogs to practice any sport activity during the hottest day hours (especially during summer) or after lunches. Please use common sense when using the Walky Dog and ride at your dog's pace. Never ride faster than your dog is walking! Beware of special cases: for big-size dogs, such as Alaskan Malamutes, the dog's behavior becomes important, too. "The dog" says Dr. Mistretta "should already be used to follow his master at the leash without pulling and he should be equilibrated enough not to be distracted by the surroundings". 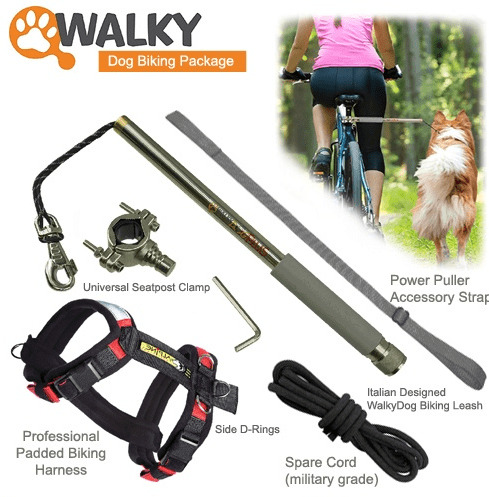 The Walky Dog Plus - sometimes referred to as Walkie Dog, Wally Dog or mistakenly referred to as the K9 bike jogger - installs in just minutes and is incredibly easy to use. 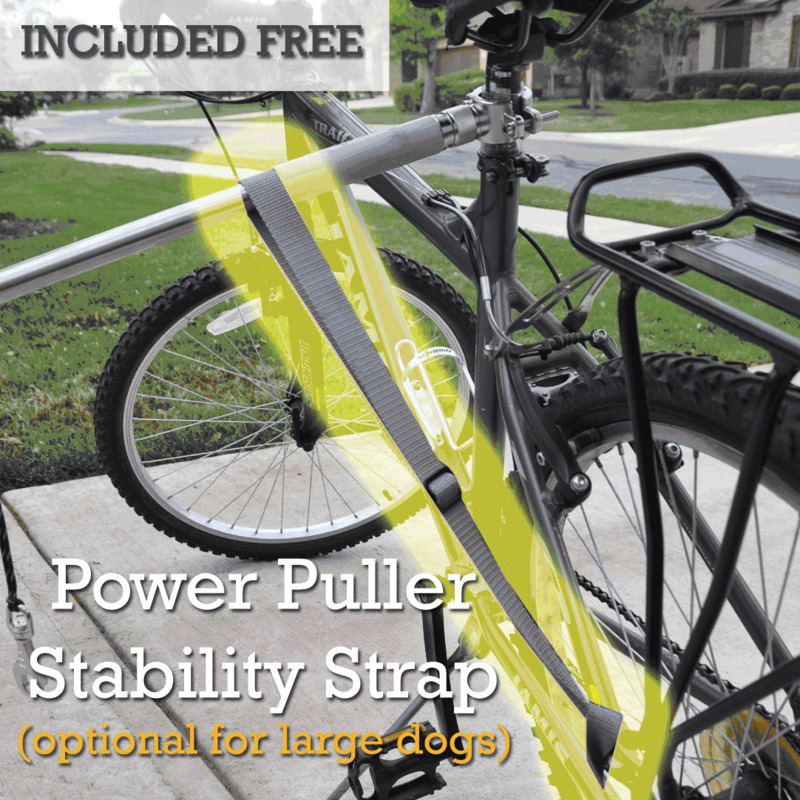 This dog bike leash was specifically developed to allow the biker to guide the dog in complete safety, by keeping both hands tightly gripped on the handlebar. 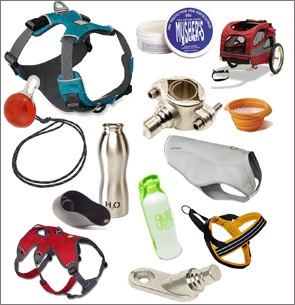 The packaging contains both assembling instructions and some suggestions to adapt the position of both the leash and the biker according to the dog's size. EUROPEAN AND U.S. PATENTS APPROVED WO2004-082372. Just wanted to drop you a quick email. We received our WalkyDog on Wednesday. On Friday after a few adjustments when attaching (had to find the right height where my foot would clear it) we took Angel, our Catahoula mix, out for her first run. She took to it almost instantly and loved it! There was a look of joy on her face as we explored our neighborhood at a fairly brisk pace that she set. Plenty of stops for water of course. ;-) Went out again on Saturday. I'm very impressed with the simplicity and high quality of the product. It seems pretty indestructible! We have a very happy dog!" Received my order the other day and LOVE it! 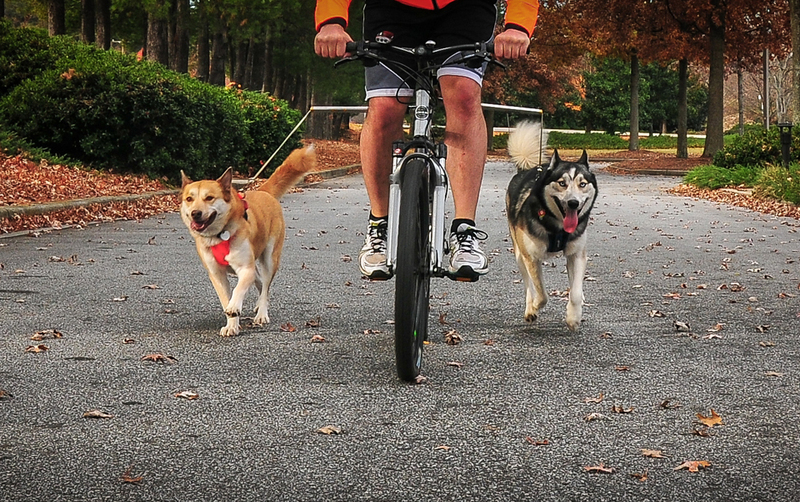 The Walky Dog PLUS Dog Bike Leash is awesome! My pup and I love it! It's so nice to finally be able to use my brakes again and hold on to my handlebars with both hands. I can tell you how many time I have almost flipped because of a sudden stop, etc. all while holding a leash in one hand and the front brake with the other. And really do appreciate the military discount you applied. Thank you so very much. Have a great day. And good luck with your business. Have a complaint regarding the Walky Dog, it is decreasing the effectiveness of my bike riding workouts! My Vizsla Sina (Shee-na), has taken to this new form of exercise so positively and quickly I have simply become something that is towed. We have built up to a four mile ride each evening (in addition to the daily five mile early morning jog); Sina runs about three of the four miles and as her stamina increases I expect the mileage to increase, but that's up to her. Your product has been superb in every way: quality, durability and design effectiveness. It has worked exactly as advertised." Both my husband, myself and our energetic German Shepard thank you!!!!!!!!!" - Tara W.
I just wanted to let you all know how much I appreciate your company and the products you promote. I held off writing to you guys for a bit, since I wanted to give the WalkyDog Plus a good testing before I wrote. I purchased the WalkyDog Plus back in February of this year and as soon as the snow here in Maryland started disappeared my dog, Hania, and I have been using it as often as we can. Started out walking with her next to the bike, but I got the "are you kidding me? let's go" stare. I switched to riding instead which proved to be exactly what Nia needed. We ride a couple of times per week - if its a weekday we ride around my rural neighborhood, on weekends we hit the rail-trails and have even biked around Gettysburg. Each week she wants to go out for longer runs. The WalkyDog is an excellent, sturdy piece of equipment - I wouldn't want to ride with my dog any other way. The only downside is Nia doesn't like the baton, until she is fully hooked to the bike. I guess it does look a little menacing from her perspective. However, once we are off riding, she is happy as can be! All rides are finished with a good application of Musher's Secret on her pads. Apparently, it tastes fantastic, because Nia tries to lick it straight out of the container if you aren't looking. 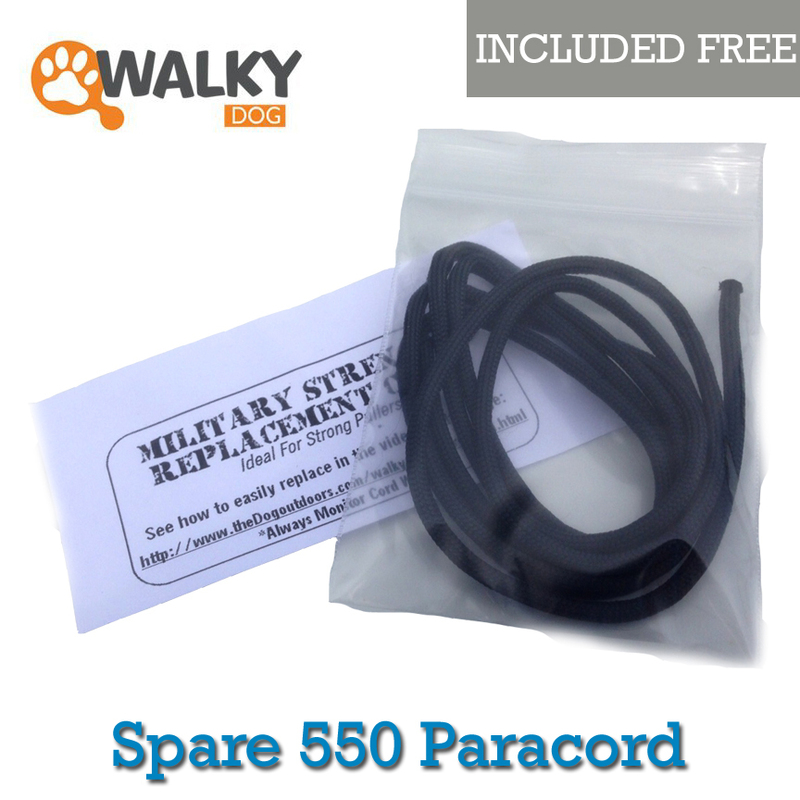 I love the WalkyDog and appreciate the fact that you all took the time to explain how it work, how to install it, and tips for use on the website." - Jeni A. "Hello! I bought the WalkyDog on Sunday and got in in today. I needed a replacement for the Buddy attachment I was using before - on one of our rides last week my pup decided to go the wrong way around a bus bench and the attachment broke. So I decided to try out the WalkyDog... and I love it! She's kept close enough for safety yet far enough to not get tangled in my pedals. We both get the exercise we need! It seems really sturdy. We've only used it once so far but I'm looking forward to many more rides with my pup. Thank you!" I received the WalkyDog Plus on Friday evening. My boyfriend installed it on my bike and it took him only 5 minutes! We were thrilled. I LOVE THIS PRODUCT!!!!! I took our dog for a trot using the WalkyDog Plus on Saturday and Sunday. What a wonderful product! I used to hold her leash in my right hand and ride that way. It worked but I feel that both the dog and I are MUCH safer using the WalkyDog Plus. When she pulls, the pull is centered under the heaviest portion of my body and therefore, I hardly feel it at all. In addition, I feel much safer because both of my hands are able to use the brakes and steer. Another thing I was impressed with was the durability. This seems to be a very well-made, durable product and I appreciate that. I loved that I can remove the rod so easily without removing the clamp when I want to ride without my dog. Very nicely designed! I am so happy that I decided to give this product a try. And, thank you for the very fast shipping." Thank you for fast delivery. I never review anything online before but I have to now. I just received Walky Dog Plus in the mail today. I hooked it up with my bike and tried on my dog right away. My dog did great on the bike. My dog had never run alongside the bike before and this was the first time. She seems to enjoy it. I love that I don't have to hold on a leash and my hands are free. It is very easy to set up. I am very excited to take my dog on a bike ride to the park this summer. "I just have to sing the praises of this product. I am a 50 year old female who has been sedentary for the past eight years of my life and I smoke. I had given up on ways to exercise our German Shepherd. My 24 year old daughter who is in excellent shape, has taken our Aries out for three-mile runs which doesn't put a dent in the dog's energy. I couldn't run a block at this point in my life. 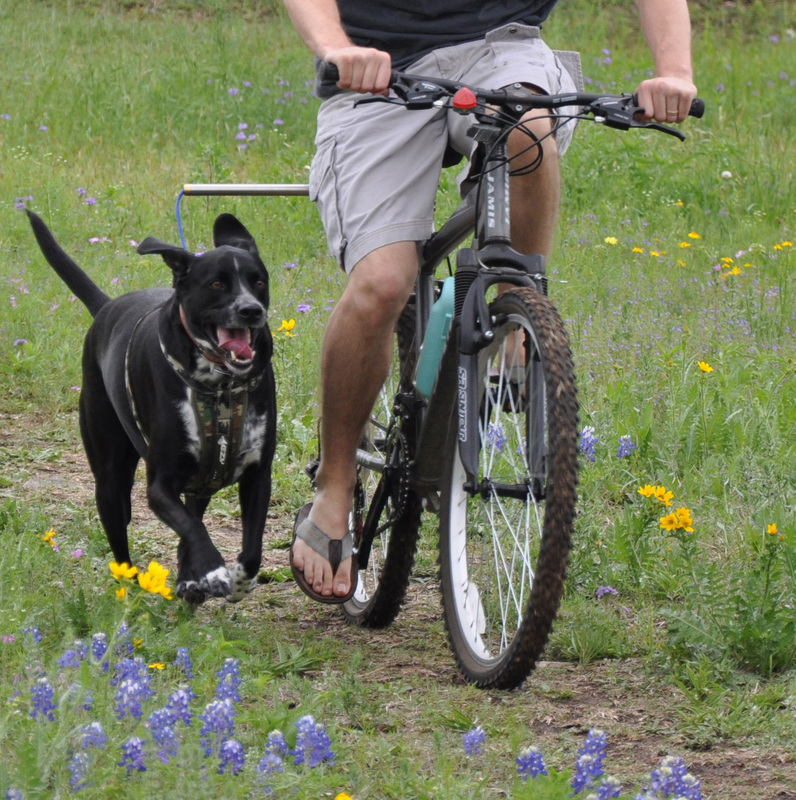 In comes the Walky Dog which I happened upon one day while doing an online search for bicycling with dogs. We had tried to bicycle with our dog just holding his leash and about killed ourselves. We couldn't keep him from running in front of the bike. I hadn't been on a bike in 15 years when we finally got the Walky Dog a few days ago and was scared to death of trying it. Day three of it and we're doing it like a pro. The first time I wobbled all over the place while poor Aries looked at me like what's your problem? He's such a wonderful dog and a good sport. Day three, and I completely have the hang of balancing. If I can do this, anyone can do it. Believe me. Aries loves it and stays right alongside of me and the bike. We had given up on ever getting this poor dog the exercise he needs. Dog parks, for us, have been horrible dangerous places, and we can't run or walk enough to keep Aries happy. The Walky Dog has completely turned our lives around. No kidding." "I wanted to take a moment to write a review of the walkydog plus that I ordered and give my impressions. First off, I received the product virtually before I ordered it. Total shipping was 2 days, and that was standard shipping. This in itself is unbelievable as I am still waiting on an amazon prime "2 day shipping" that is over a week late. Second the product was very smartly packaged. It was a simple but sturdy white box, but that is part of the point. It was just enough to cover the product without any waste and I appreciate this. As for the product itself it was similarly packaged in a minimalist form, though it did include all tools needed. From researching the product I anticipated this but I was still impressed with a company that would include all required tools. The function itself is remarkable and beyond impressive. I had been comparing this product to another well known spring based system of twice the price and I must say that this is a much more useful product. First off it does the same basic job of controlling a dog while on bike. This was throughly put to the test as we encountered several squirrels on our maiden voyage and no injuries were sustained by any parties. I must say that I was very surprised at the ease of controlling a large lab darting for a squirrel. I felt it, but at no point did I fear I was in any danger of falling or losing my dog. I believe I was very lucky in that my dog took to the product nearly instantly and we were up and running, and I do mean running, in less than 5 mins. I had intended to make a simple trek to the end of the block but our jaunt turned into a 5 mile journey without a hitch. There was of course the initial hiccups of pulling, and not stopping together but as the miles piled on we became a more and more synchronous unit. I could tell you that as a long time dog lover I have bought many many products but lets be honest, thats all pointless. The reality is even if I had never bought any product for any dog ever, I would place this product as a required dog item under food, a collar, and a basic leash. It is truly that important that every dog owner should have one. One key point, however, is that this product needs a harness just as the inventors say. While you can use it with a collar, the wheezing sets in pretty quick and this makes it unenjoyable for all involved. Luckily I had the recommended ruffwear harness already and once I strapped my pup in we were off to the races.